who can help with the choice? what choice? you mean equipment? Im gonna go out on a limb here an guess that you havent experimented with iot yet, but have seen it in action and are super excited to get off the ground. I say start here and then you will know more about what you like and dont like. Are you asking for help with the choice of hardware? If so, are you want help with the sensors/actuators or the MCUs, or both? Regardless of the hardware you choose, I’d suggest you take a look at using Node-Red as your primary ‘hub’ for the data processing, and MQTT as the way of communication between devices and the hub. I have more info to add to this topic, as it’s also used to control my heating/cooling system and indoor lighting, but these write-ups are still work in progress. That’s a bit like saying “I want to totally refurbish my house, do you have a shopping list of all the parts I’ll need, and the instructions on how to do it”. Everyone is starting from a from a different place, and wants a different end result, and will need different materials. Some people will build a home automation system that is as non-invasive as possible, because they live in a rented property, or because local regulations prevent changes to electrical systems. Others will be happy to rip-out the mains wiring to their light switches and replace it with low voltage wiring, embed NodeMCU’s in their walls and hack their garage door closers so that they have a mind of their own. If you create a DIY smart home it will be a project that takes on a life of its own and becomes a seemingly never ending journey. For most people, this is why they create these projects in the first place! 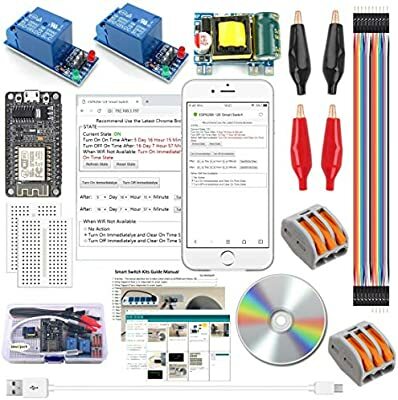 As @lvennard has said, you need to start your journey by buying some kit (I’d reccomend some NodeMCUs and Wemos devices) and starting to learn. A few days of reading on the forum should give you a few ideas of where to start. Wow You basically made the IoT equivalent of an open ended question like “I want to go from point A to point B… how?” With the options being… walk, crawl, run, peddle, drive, fly, float, teleport, dream, etc… and all the unlimited variants of each choice. Actually, I think it’s more of a philosophical question; Do you want to go from point A to B the shortest or the fastest way? But I concur - WOW!